Last time we brought you the first in the series of our three features on escapeVektor. In this second instalment, we tell you about another enemy type, as well as details on the secrets and achievements to be uncovered in the title. escapeVektor™ is a retro styled arcade game in which the player controls Vektor, an entity trapped inside the player’s CPU. Each node (level) consists of a series of interconnected lines which form cells. These are claimed as Vektor moves along them. 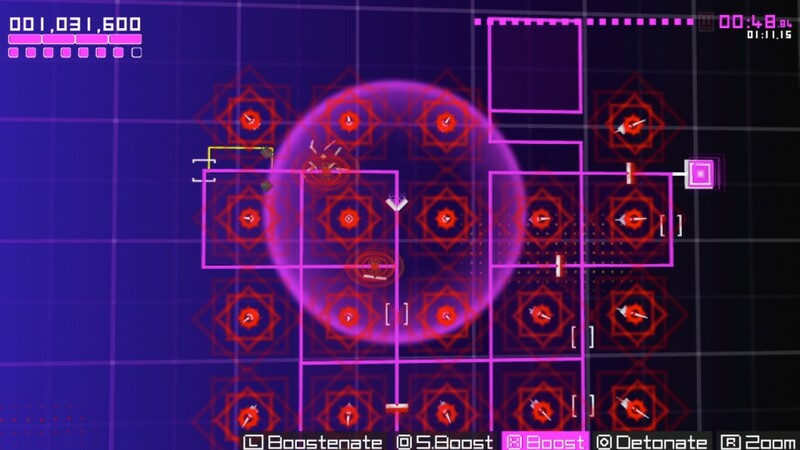 Claiming all of the cells in a node unlocks the exit to the next node, bringing Vektor closer to his escape. We told you about about those dumb Patrols in the first part of our escapeVektor feature. We also described the dangerous Electric Fences and Cannons, not to mention Vektor’s useful abilities. Now it’s time to find out about another enemy and see how you get Vektor out of there. Hunters are much more intelligent than Patrols. They will search the whole node in their attempt to track you down. They’re not fully awake when they spawn though and may just pick the wrong direction when chasing you. But as they start to wake up, they become more alert and are more likely to track you down, so there’s no room for complacency when dealing with these tricky enemies. Hunters are sometimes spawned by passing through a switch, so think about which parts of a node you complete first. Spawning a hunter early in a node means he’ll be chasing you while you’re dealing with everything else that’s going on. Waiting until you’ve nearly completed the node before triggering the Hunter is far more tactical. However, if you’re an adrenalin junkie who likes white knuckle rides, go ahead, and spawn the Hunters early. Just don’t say we didn’t warn you! Watch out for these Cannons! 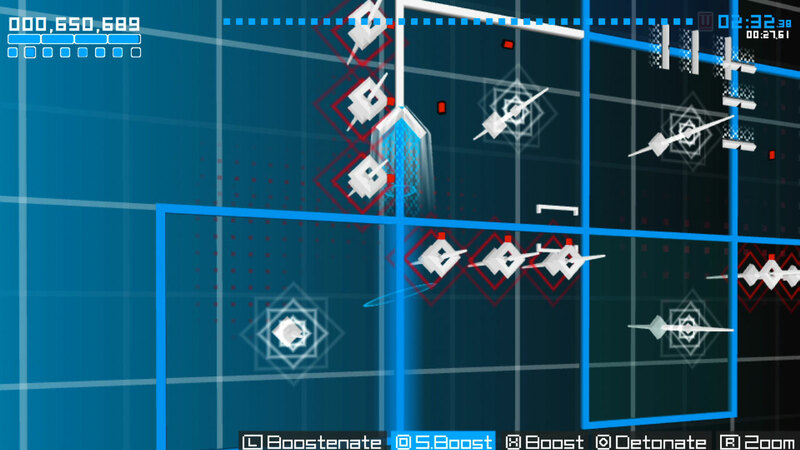 Once you’ve claimed all of the cells in a node, you’ll trigger the exit and every enemy will be destroyed. Enemies respawn though, some of them very quickly, so you might just find yourself in trouble even on your way to the exit. Try to make sure you’re not over an enemy spawn point when the exit has been triggered. All of your hard work may have been in vain if a rapidly spawning enemy destroys you on your way out. Destroy all enemies in your Detonation range! Sometimes triggering an exit will also unlock a hidden area in a node (level). Completing these areas will trigger a second exit which will lead to a different node or zone and occasionally a shortcut to one of the later zones or bonus zones in the game. If you choose to enter one of these later zones, be prepared for the difficulty to ramp up significantly! Vektor has been locked inside the CPU for so long that he’s forgotten how he got there in the first place. Moving through the CPU will help him unlock his memories so you need to make sure you get through all of the nodes. If your strategy is to get to the final node as quickly as you can through the hidden exits, be sure to go back and complete the nodes you skipped so that all Vektor’s memories are unlocked. Your score at the end of each node will determine whether you win a medal or not. The time you take to complete the node is an important factor in the score so don’t worry if you initially don’t get a platinum medal in the early nodes. Once you unlock Boost, go back and have another try. You’ll find it easier to get a higher score. If you win a bronze or silver medal, you’ve certainly got the hang of things. You’ll need to be little more adept to win a gold medal though, and downright professional to even get a look at a platinum. Be warned, we’ve set the bar high! Which path will you choose to take? Whatever it is, watch out for these Hunters and try not to let that CPU get the upper hand. In the next part of our escapeVektor feature, we’ll tell you about the most dangerous enemies: Interceptors, Munchers and Locusts. In the mean time check out the trailer of the Nintendo 3DS version. This entry was posted on Wednesday, December 19th, 2012 at 9:32 am	and is filed under news. You can follow any responses to this entry through the RSS 2.0 feed. You can skip to the end and leave a response. Pinging is currently not allowed.